Since the unofficial end of summer is this weekend, I thought I'd share one last summer salad recipe. 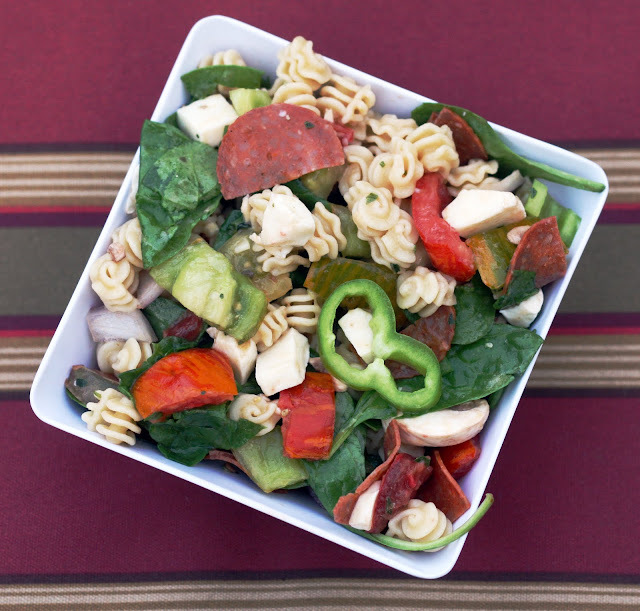 This one is perfect for taking to party as it appeals to even picky eaters and the pasta salad adverse. It is basically all of the ingredients that make up a typical pizza tossed with pasta. Who doesn't like pizza? The dressing is light and garlicy, not creamy or overpowering and just really pulls all of the flavors together. I used some heirloom tomatoes I picked up at the farmers market (my tomatoes have been slow to ripen this year) but I think halved cherry or grape tomatoes would work well.